Despite some good work on music and graphics, wesnoth is the most annoying game ever invented. One of the biggest deceitfulness is the clueless claim to be a strategic game, while it is only a chance based board, something between gambling and card games. And no more interest can be added trying the online game, because the worst is the 'community', you have the feeling that this is some social experiment to measure how much impolite thing can go on. Regarding this point, inappropriate reactions from so-called moderators are worsening the whole stuff. @HappyDwarf: Seriously? Have you played the game. Yes its like between gambling and card games, but it is addictive and fun to play. And the 'community' is best like and other open source community. go to forums and they will answer everything you might ask. They are really helpful. And if its annoying game then you should then don't play it. You even not know how much efffort those developers done to make this game. SO you better STFU! @R5KSS, telling a person to shut up for having their own opinion? Seriously? What if you calm down and accept that not everyone likes the same games you do? 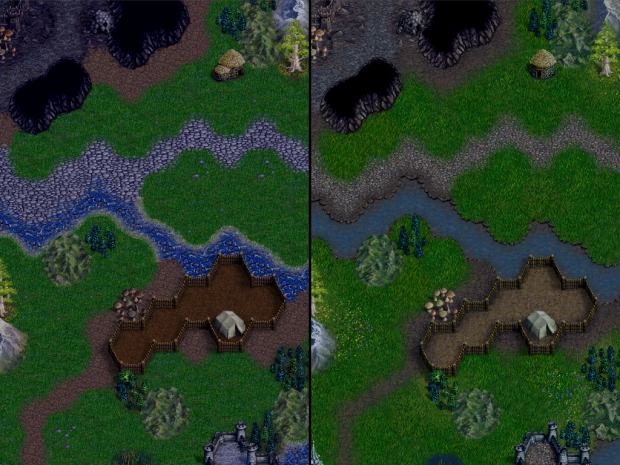 The terrain art in Battle for Wesnoth 1.10 has greatly improved. It is shown on the right.